Sound the ‘awesome news’ siren! We’re thrilled to confirm that Claire North’s astounding new novel 84K has been optioned for television by Tall Story Pictures. The full press release is below. We publish 84K in hardback, trade format, ebook and audio on 24th May. Rights for the award-winning Claire North’s new novel, 84K, have been optioned by Tall Story Pictures, an ITV Studios production company who plan to develop it as a major international television drama series. 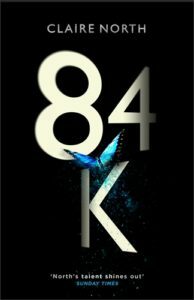 Described by writer and activist Cory Doctorow as ‘an extraordinary novel that stands with the best of dystopian fiction, from 1984 to The Chrysalids, with dashes of The Handmaid’s Tale’, 84K [UK/US/ANZ] is a speculative fiction tale in which people’s lives are assigned a monetary value, based on how ‘useful’ they are deemed to society. Claire North is a pseudonym for the author Catherine Webb, who wrote her first published novel when she was just fourteen years old. Her first book under the Claire North name was the word-of-mouth bestseller The First Fifteen lives of Harry August [UK/US/ANZ] – a Richard and Judy, Radio 2 and Waterstones book club title. Rights in Harry August are already under option with Blueprint pictures, the production team behind the film Three Billboards Outside Ebbing, Missouri – winner of four Golden Globes and nominee in seven Oscar categories this year. This rights deal news follows multiple accolades for Claire North over the past year, including her being shortlisted for the Sunday Times/PFD Young Writer of the Year Award for her novel The End of the Day [UK/US/ANZ], and winning the World Fantasy Award for Best Novel for The Sudden Appearance of Hope [UK/US/ANZ].